Roberta Ahrens is one of Northern California’s Master Decorative Painters & Fine Artists. With over 30 years experience in the application of classic and contemporary painted finishes throughout the San Francisco Bay Area. 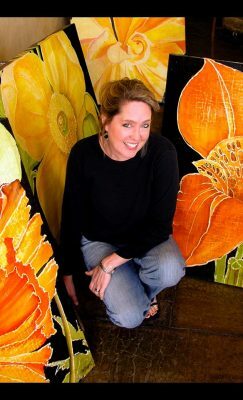 Roberta’s extensive experience in painting large-scale murals combined with the practical knowledge of artistic applications acquired over a long career led her to develop a unique style of Fine Art painting in 2005. She continues to develop and refine the technique of painting on hand-prepared canvases called “cracked linen”. Her love of horticulture brought her to focus on botanical subjects, diving into what she calls the architecture of nature. The results are truly breathtaking. By etching into the plaster she creates a new contemporary yet interestingly old world style, adding a depth and presence to her floral subjects that sets her work apart. She is considered an “emerging artist”, with a body of over 200 fine art pieces sold since she began her focus on Fine Art in 2005.